Had this taken place today, imagine the selfies. In December 1970, Elvis Presley (Michael Shannon) was still considered “the King”, however, he didn’t want to be just that anymore. If anything, his one true dream was to become a CIA agent, where he would look over America and make sure all of the old past-times stayed put and that none of these hippy, flower-power children took over society. But in order to make all of his wildest dreams come true, he would have to be accepted into the CIA in the first place and, most importantly, have a chat with the one, the only, President Richard Nixon (Kevin Spacey). But even though he was the King and quite possibly, the most well-known and famous celebrity of all time, even Elvis himself couldn’t get into the White House with an appointment. So, in order to make sure that it all happened, he would need the help of a former friend/confidante of his, Jerry Schilling (Alex Pettyfer), to make sure that all that everything went down all according to plan. Of course, though, because it’s the President, it’s a known fact that everything has to work out perfectly, with no surprises whatsoever. However, when you’re working with the King, anything can possibly happen. And yeah, the rest is obviously history. It’s hard to imagine that a movie could be made about the infamous meeting between Elvis Presley and Richard Nixon, two of the most iconic figures of the 60’s and 70’s, let alone, of all time. Of course, it was said to be a zany happening that nobody quite made sense of, yet, thanks to a photo and some speculation, we have a whole lot of odd history and yes, now even a movie made of the meeting and everything that went into it to make sure it all happened. Did we really need one? Better yet, did we need an-hour-and-a-half one? Of course, a lot of what Elvis & Nixon does and says about the leading up to and the actual meeting itself, may be all bull-crap, but it makes for entertaining bull-crap that’s fun to watch. We don’t really need to know anything more about these two than what’s presented to us as is, and therefore, we sit, wait and wonder just when the two are going to meet, just what’s going to happen, and exactly what the heck Elvis himself was doing bringing guns into the White House after all. Sure, you may not have these questions on your mind in the first place, or even care in the slightest, but Elvis & Nixon is the kind of movie that brings you into its story, whether you like it or not. Then again, there is something to be said for the fact that the movie doesn’t seem to trust its two figure-heads quite enough to make this whole movie, their own, as there’s whole lot of attention paid to Alex Pettyfer and his character, Jerry Schilling. Yes, it’s to be said that Schilling played quite a big part in actually getting the two icons together on that one fateful day, but really, do we needed a whole subplot dedicated solely to him, his issues, and whether or not he’s going to make it home to Sky Ferreira? Not really, and while Pettyfer is fine in the role, it’s sort of thankless and doesn’t really seem like it matters in the long run. Same goes for the likes of Johnny Knoxville, who gets one or two funny lines, but essentially, is just there to say somewhat perverted things and be the “comedic-relief”. And it’s a bit of a waste because, thanks to the likes of Colin Hanks, Evan Peters, Tate Donovan, Kevin Spacey, and Michael Shannon, the movie’s plenty funny. Why this character needed to be around, doesn’t really make much of sense to me and just seems like it takes up more unnecessary time in already very short movie. But as is, thanks to Spacey and most importantly, Shannon, Elvis & Nixon works quite well. Had the movie just been the two just them, sitting in the Oval Office, chatting it up, it probably would have been just as exciting. However, that doesn’t happen, but it doesn’t really matter; they’re both great, whether apart or together. Spacey may not seem like the right fit for Nixon, but fits into the role quite well, nailing all of the mannerisms that made Nixon himself such a character to watch. And then, yes, there’s Michael Shannon as Elvis, who is pretty great, showing us a humane King, that not only knows the limit of his ability as a superstar, but also realizes that the time has come for him to live a normal, everyday life as any other citizen. Elvis rarely gets the movie treatment, but here, it’s obvious that if they ever do give us another shot at watching Elvis’ story be filmed, Michael Shannon would be a perfect, if oddly unique choice to do it all over again. 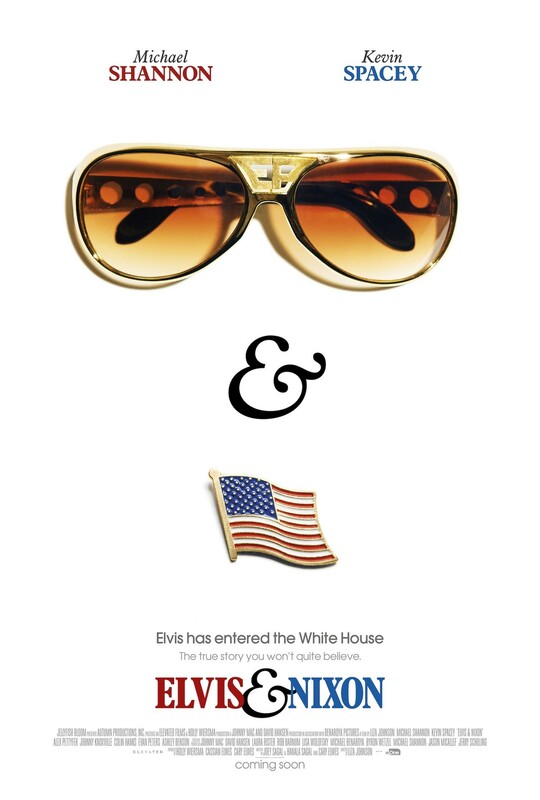 Consensus: Surprisingly overstuffed for such a short movie, Elvis & Nixon isn’t perfect, but is funny, entertaining, and well-acted enough to work and make us think a little more about this odd slice of American pop-culture. Together, they could be the bestest of pals. I enjoyed it much more than I expected to. Alright! I’m yet to see it. I’m wondering how Spacey’s Nixon compares to his House of Cards character! Really cool review.